Since I finally set a custom username “vanity URL” for my Facebook Fan Page, I’m excited to be able to promote the “Get More Fans with SMS” feature that Facebook launched about a month ago! There is definitely a spiked interest from businesses, and those with Facebook Fan Pages, who are trying to figure out every way possible to grow their fans. We’ve recently figured out how to promote a Fan Page from a personal Facebook profile – which was something new that we haven’t seen anyone else doing, until we started doing it! Tell people to text “fan Social.Media.SEO.Blog” to FBOOK (32665) from their mobile phones, and they will be added as fans instantly. Standard charges may apply. 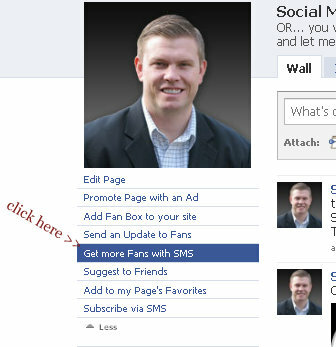 ** This only works after you’ve established a username for your Facebook Fan Page. Read more about setting a custom username here. The benefit of being able to have people text to become a fan is simple – it adds to the arsenal of strategies that you, the Facebook Fan Page admin, can start taking advantage of. I’ve tested out the SMS to Fan technique already and it works perfectly. So start adding your SMS to Fan info to your marketing material, your email signature blocks, business cards and more. And watch as your Facebook Fan Page grows!